Telugu Desam Party in its reply to the Election Commission on Sunday said that the poll body was avoiding holding a discussion on EVMs and its tampering rampant during elections. Read the full story here. The EC on Saturday sent a notice to TDP, maintaining that “such antecedents do not inspire confidence,” the Election Commission (EC) invited the TDP to send another expert “who does not have similar antecedents” to interact with the poll panel on Monday over the EVM issue. 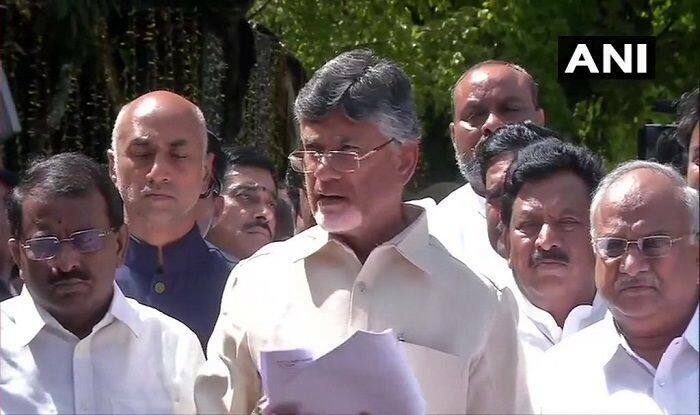 The notice to the legal cell of the TDP came after a delegation led by Naidu met the EC on Saturday afternoon to discuss poll-related issues, including those related to the functioning of EVMs. “However, when this technical person came, it turned out that he was Hari Prasad who was involved in a criminal case regarding the alleged theft of an EVM machine in 2010 in which an FIR was filed. “Whatever may have been the eventual outcome of the investigation, it would be appreciated that such antecedents do not inspire confidence,” the notice said. It added that it was “completely intriguing as to how a so-called technical expert with these antecedents was allowed to be a part of the delegation” led by Naidu. The poll panel said while it was not found appropriate to have any interaction with Prasad, it invited the TDP to send another expert “who does not have similar antecedents” to interact with the Deputy Election Commissioner on Monday. Earlier, after his meeting with Chief Election Commissioner Sunil Arora, Naidu said the EC has lost its credibility as “it functions on the instructions of Prime Minister Narendra Modi and his office”. Raising questions on the poll panel’s independence and impartiality, Naidu told reporters outside the EC headquarters here that the level playing field — an essential attribute of democracy — “now stands disturbed”.